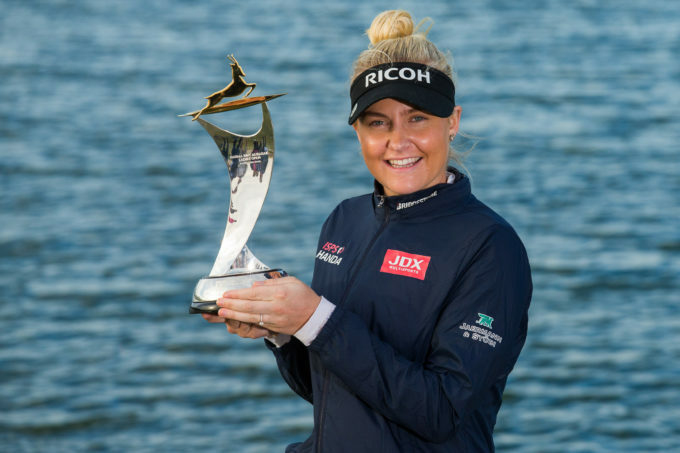 12 January 2019; Abu Dhabi, United Arab Emirates: England’s Charley Hull made the best possible start to 2019 when she claimed a wire-to-wire victory in the Fatima Bint Mubarak Ladies Open to earn her second Ladies European Tour trophy. “I’ve practised really, really hard over the winter and it feels great to win back on the LET, especially since I had my first pro win in Morocco a five years ago,” said Hull, the Rookie of the Year in 2013, who went on to win the Order of Merit in 2014. But the round of the day belonged to the 2017 champion, Aditi Ashok, who signed off with a 66 to finish in tied eighth position with Jenny Haglund and Nanna Koerstz Madsen on two-under.